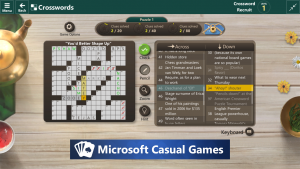 Check out the latest addition to the Microsoft Casual Games product family! 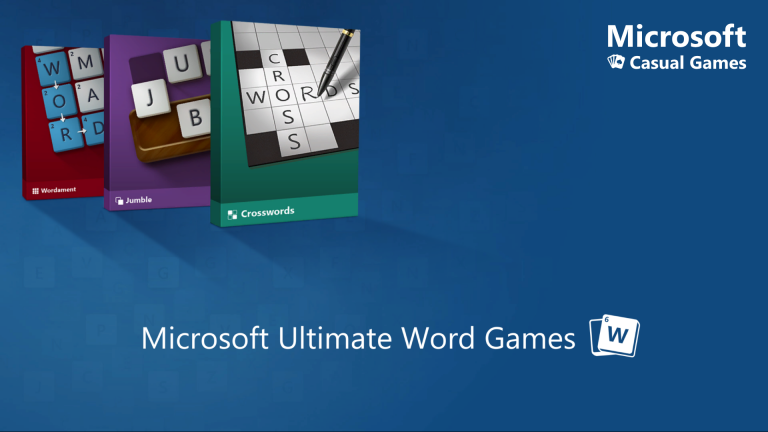 Microsoft Ultimate Word Games is the ultimate collection of the three best word games for Windows 10, including Crosswords, Wordament, Jumble. 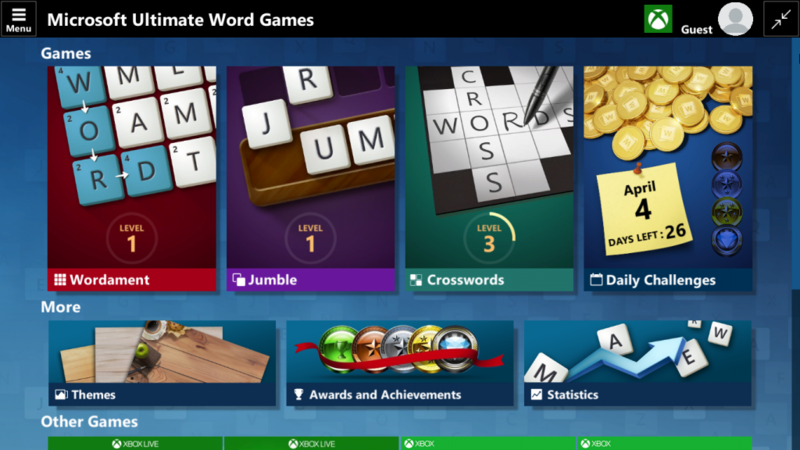 With multiple game modes and fresh Daily Challenges every day, Microsoft Ultimate Word Games is a great way to exercise your brain and relax while having fun! The best Crosswords game you’ll find anywhere! With multiple board sizes, difficulties, and plenty of options, you can play Crosswords exactly the way you want! The evolution of the hit-game on Windows, iOS, and Android. Find as many words as you can on a 4×4 grid of letter tiles. Play single player or multiplayer versus thousands of players at once! Jumble is a super-addictive game where you are given a rack of letter tiles, and your goal is to create words using them. Each game mode has multiple adventure maps where you can earn 3 possible stars on each puzzle. Earn at least one star to unlock the next puzzle and see if you can reach the treasure at the end of each map! Each game has a unique Daily Challenge every day. 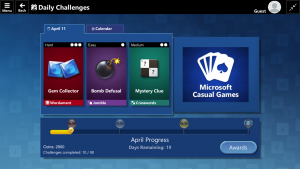 Complete enough Daily Challenges in a month to earn special badges. The daily challenge keeps crashing since the last Windows 10 update. As soon as I open one of the daily games, it crashes. It's been like this for almost a month. I have reset the game, uninstalled and reinstalled the game, made sure all my drivers are up-to-date, pretty much anything I could think of to fix the problem. I really don't want to uninstall the update because they exist for a reason, but I cannot think of anything else to do. Any suggestions? I couldn't download this game on my Surface RT. 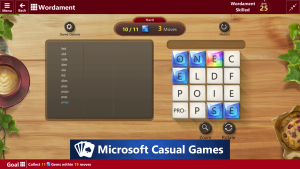 Just redirects to Wordament, and I learned that Wordament is now integrated into Ultimate Word Games. Why not makes UWG available on the Windows Store for Win8.1 RT? We had a web outage & my husband & I played MUWG offline. I was doing maps for Wordament & Crosswords. My husband did both of those & Jumble as well. He can load MUWG without any issues & do challenges & puzzles. I CAN'T - IT IS STUCK FOR AT ONE POINT OVER AN HOUR ON THE "LOADING" SCREEN WHERE THE LITTLE TILES SWAP BACK & FORTH. We have one admin logon & then a logon for all of us who use the computer. We use the lower level logons for security purposes...I went into the admin logon & uninstalled then reinstalled the game & IT IS STILL DOING THE SAME THING AFTER I UNINSTALLED THEN REINSTALLED. Since the other computer seems to have no difficulty loading MUWG, I think something is wrong with resolving my account between the cloud & the computer. I CANT FIX THIS-CAN YOU TELL ME WHAT I NEED TO DO? THANKS for any help you can render. PS I was considering getting the premium, ad-free version, but now, I am not sure that it's worth it if MUWG won't work. MUWG is actually my favorite of your casual games. 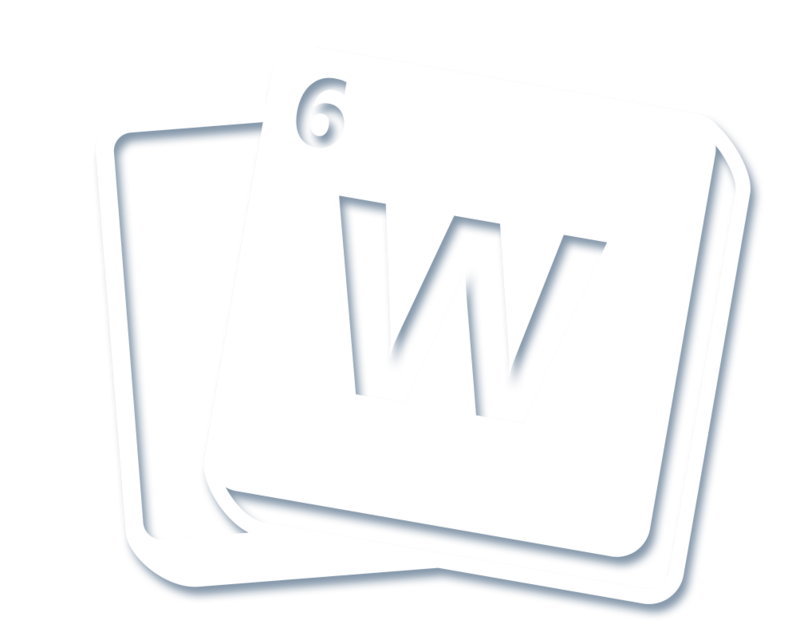 I have completed all the puzzles in Wordament, how do I get more? Me too! Hope they start supporting this game again. The Jumble daily challenge won't load today! No more Crossword Maps! I only have the maps for 2017 which I have completed! Where are the maps for 2018? No more world maps either finished the 8 available to me. And where are 2019 maps. My favourite game as well. Crosswords still come up on Daily Challenge though! There were only April-December 2017 maps. There were 13 world maps but a few days ago, they added Map 14. Try using the slide bar on the right of the map window to get to all the maps. If this is suppose to be a continuous game, the owners need to get busy and keep the maps coming. The Cloud Sync issue is big. I abandoned this a few months ago because of it. I tried again last week and lo and behold it sync'd and restored my previous levels. Played for 2 days and decided to go Premium again. What a mistake. Now it is back to the Can't sync with Cloud error and cannot save my progress. What the heck! This is so outside the realm of MS when there are problems. This is not getting fixed and seems to have been abandoned. 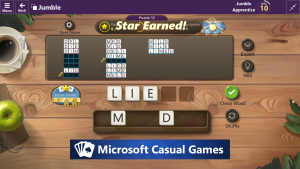 The Dev team on this game needs to be re-evaluated for whether they belong at MS.
where does Microsoft list the words considered valid for these games: Wordament and jumble and other word games of Microsoft. Any new maps available?? Or has the game been abandoned? I have the same question. Agree with comment regarding 2018. Although are the world maps 1-13 the 2018 games? Where are the new maps for 2019? The last maps I have are 2017! So even some 2018s would be nice! Is there any fix that works for can't sync right now? I have tried everything from resetting it to reloading it. I thought this was a short term issue so I played offline for a couple of weeks. After reloading Ultimate word games I lost all my data and was reset to stage 1. It still will not sync with my online data. At this point I would be willing to start over and have my online data erased if that will fi the issue. I used to play daily. Due to conflicts between Windows 10 and Govt. sites I use for work, I reverted to Windows 7 Ultimate. I am unable to regain my entry into Ultimate Word Games. Can you assist me? I lost all of my daily challenge progress from day I installed the game last year but kept my achievements. Can someone please tell me how to get theo progress reinstated? Please add CROSSWORDS in German Language!!! Thank you!!!!!!!!!! Please update crosswords. No new puzzles for 2018 are available. I solved it but cannot see the word. What are the letters? 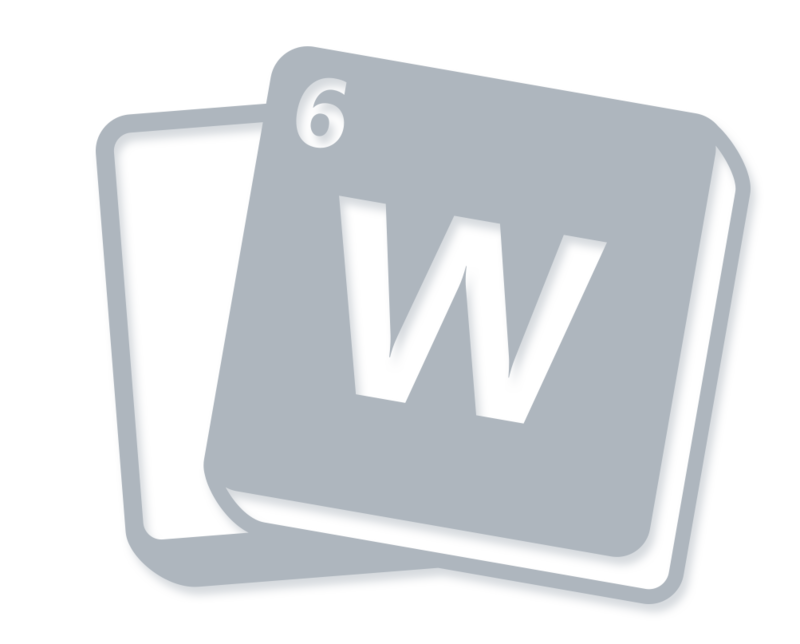 Why can't I sign into wordament on my laptop anymore? It says my purchase didn't go through and thinks I'm using a cell phone. Now I have to play as a guest! Not liking it! 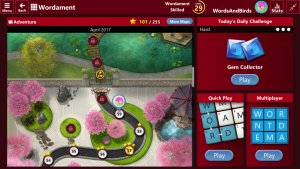 Wordament is my favourite, most enjoyable game! Why can I no longer participate!